uuid : ffe1280c-cc92-4584-927b-c84a09f64c85 templates_id: 119519 templates_uuid: "54d2efe9-f061-406f-a6df-c178d564a2a2" title: "Loan Agreement - Loan Contract - Loan Agreement Template " display_name: "Loan agreement" meta_keywords: "Loan contract and Money lending agreement" description: "
Protect yourself when you intend to lend money to or borrow money with this loan agreement. This straightforward loan contract contains everything needed to protect the borrower as well as the lender, ensuring that both comply with the law in the process. It covers repayment details, \302\223warranties\302\224 given by the borrower, obligations and restrictions on the borrower, as well as how to end the loan agreement. A loan agreement is a contract under which a lender agrees to lend a certain amount of money to a borrower. It sets out the conditions of the loan such as the interest rate and the repayment period, and imposes obligations on both parties. A loan agreement is an essential document whenever you need to lend or borrow money, for example if you are starting a business and require working capital. A loan agreement outlines clearly how and when the loan will be repaid, which ensures both parties are protected during the lending process. How should the borrower repay the loan? What is the interest payable in a loan agreement? When lending money, an annual interest rate applies and is calculated based on the amount of the borrowed sum. The interest rest is payable by the borrower monthly or quarterly, and can either be a fixed percentage or a percentage above the base lending rate of a bank. In case of late payment, another daily interest rate applies, payable from the date of non-payment to the date of actual payment. The daily interest rate for late payment is a percentage above the annual interest rate. Does this loan agreement allow for early repayment? Yes, in this loan agreement, it is possible to include a provision saying that the borrower may repay the loan in whole or in part at any time, by giving a certain notice to the lender. It is possible to include an early repayment fee, which is a percentage of the borrowed amount. What\'s the difference between a secured and an unsecured loan? A secured loan is where the borrower promises a property or other asset to the lender as collateral for the loan. This means that the lender may take ownership of this asset if the borrower defaults on the loan. When the loan is unsecured, the lender won\'t be able to take ownership of the borrower\'s assets in case of payment default. Can the lender ask for immediate repayment of the loan? The lender can cancel the term of the loan and ask for immediate repayment in case of default by the borrower, ie if the borrower fails to pay the sum payable in due date or fails to comply with any provision of the loan agreement. This loan agreement is governed by the law of England and Wales.
" created_timestamp: "2018-10-08 04:36:37.0" modified_timestamp: "2018-10-08 04:36:37.0" active: true created_by: 104 modified_by: 104 dcm_id: 301 url_slug: "Loan-agreement" meta_description: "Prepare a loan agreement with step-by-step guidance from Rocket Lawyer. Protect yourself when your company intends to lend or borrow money from another company with this loan contract. Try this money lending agreement template for free.\r\n" time_to_complete: "20 minutes"
Protect yourself when you intend to lend money to or borrow money with this loan agreement. This straightforward loan contract contains everything needed to protect the borrower as well as the lender, ensuring that both comply with the law in the process. It covers repayment details, warranties given by the borrower, obligations and restrictions on the borrower, as well as how to end the loan agreement. What's the difference between a secured and an unsecured loan? When the loan is unsecured, the lender won't be able to take ownership of the borrower's assets in case of payment default. More than just a Loan agreement template, our step-by-step interview and guidance makes it easy to create your document. Easily create online, download, print and sign your free Loan agreement in minutes. 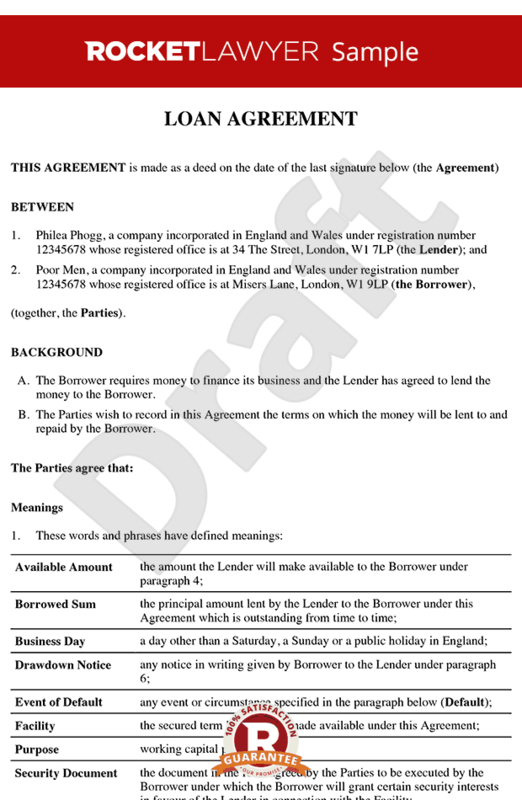 This document is also sometimes called: Loan contract and Money lending agreement.